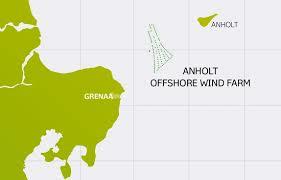 The Anholt Offshore Wind Farm is a marveling accomplishment of determination, diligent planning, and altruistic goals. Building the large 111 wind turbine farm was a massive undertaking for an ordinary Danish energy company. Regardless of this, the farm was built comprehensively, safely, and efficiently. It now provides 4% of Denmark’s power, and is responsible for giving electricity to homes, which allows families to cook their meals and charge their cell phones (Busch). Although the energy provided by Anholt allows mundane, ordinary tasks to be completed in residential homes, the making of this wind farm was anything but ordinary. The Anholt Offshore Wind Farm is located in the Kattegat, which is an area of water, between Djursland and the island of Anholt (DONG Energy). It is about 21 km away from the shore, thus situating it far away from land (Renewable World Energy). With a nameplate capacity of 400 mega watts, it is the third largest wind farm in the world, and Denmark’s largest wind farm (Renewable Energy World). It is almost double the size of the Horns Rev 2 (Renewable Energy World). It also contributes 4% of Denmark’s energy. The whole wind farm is 20km long and 5km wide (DONG Energy). Because of prior agreements, it could not take up more than 88km2 within the project site (DONG Energy). The site area includes 111 3.6 mega watt wind turbines, cables, offshore grids, and transformers (Busch). DONG Energy won the license to create the project, Siemens Wind Power secured the order to supply the wind turbines to the project, and Energinet.dk was in charge of the offshore substation (Renewable Energy World). On the human side of things, the wind farm’s base was in Port of Grenaa (4C Offshore). DONG Energy needed to monitor boat traffic during construction near the wind turbines, to ensure no destruction was occurring and to maintain the citizens safety (Corporation). Old buildings were put to use for operation buildings in town, which helped the town by creating new jobs (Corporation). Creating this wind farm also helped create new jobs in the town in general, because many people worked on the project in the area (Corporation).